Recently, I interviewed Guy Roberts for The Shakespeare Standard. Roberts is CEO & Artistic Director of the Prague Shakespeare Company, as well as the Artistic Director of the Mermaid Theatre Company, a US based classical theatre company. The Prague Shakespeare Company (PSC) is the Czech Republic’s only professional English-language classical theatre company. Founded in 2008, the Prague Shakespeare Company provide classical theatre in English to “Prague’s theatre community, expat community, arts patrons and students.” For the 2013-2014 season, PSC has some exciting new changes! CK: Can you begin with a brief overview of the history of the Prague Shakespeare Company ? The Prague Shakespeare Company was really born in the summer of 2007 on my second day in Prague as I was walking across the Charles Bridge. The City of Austin, Texas in the United States, where I was living and working as the Artistic Director of the Austin Shakespeare Festival, had given me a grant to travel to Prague to direct an English-language version of Macbeth with Divadlo Miloco, an alternative mutli-lingual Czech theatre company working out of a warehouse space in Letna. On that second day in Prague, feeling the indescribable pull somewhere deep within from my Czech ancestors, overwhelmed by the beauty and splendor of the city and struck by the fact that unlike Paris, Berlin, Vienna, Brussels and Hamburg (to name only a few) Prague did not have a professional English-language theatre, I resolved to do everything within my ability to create a professional English-language theatre for the Czech Republic with Shakespeare and classical theatre as the core artistic aesthetic. I returned to the United States, resigned my position as Artistic Director of the Austin Shakespeare Festival and began the slow, at times arduous but always exciting process of creating the theatre. Since its inception and official Czech Republic premiere with a revival of Macbeth at Divadlo Komedie in 2008 (at that time produced under a slightly different name – the Prague Shakespeare Festival), through today PSC continues to entertain, enlighten and inspire through our comprehensive variety of public events including performances, workshops, lectures, classes and extensive educational initiatives. Partnering with Vyšehrad, the ancestral home of the City of Prague, we have presented outdoor English-language performances of Shakespeare on the summer stage of the National Historical Monument of Vyšehrad of Romeo and Juliet, A Midsummer Night’s Dream and a special double bill of King Lear and As You Like It that toured to Houston, Texas in the United States and featured a multi-national ensemble of theatre artists led by the Czech star Pavel Kříž. Every season as our audiences and support grew so did our ambitions. In 2009 we began sharing our unique style of creating Shakespeare plays with a wider audience in America through performances in Chicago (the sister city of Prague) and in Houston, where we have benefited from the large number of Czechs and Slovaks who immigrated to Texas in the 19th and 20th Centuries. Partnering with Classical Theatre Company our One Man Hamlet, As You Like and King Lear were extremely successful with audiences and critics alike and laid the groundwork for PSC’s expansion of activities within the Czech Republic. August of 2011 saw the premiere of the PSC sister organization, The Krumlov Shakespeare Festival and two weeks of performances of As You Like It in Český Krumlov as we transformed the Courtyard of the Hotel Růže into something resembling a makeshift stage of Elizabethan players. Buoyed by our success internationally and domestically we began our 2012 season determined to fulfill the promise of our earlier successes. Co-producing productions of Richard III and Venus and Adonis with Main Street Theater Company and Shakespeare Orange County gave us the confidence to enter into our most exciting endeavor – an association with the National Theatre of the Czech Republic. In the fall of 2012 we presented two months of sold out English-language Shakespeare in association with Národní divadlo at Divadlo Kolowrat and featuring Czech subtitles courtesy of our friend Martin Hilský, PSC solidified its place as the premiere English-language Shakespeare company in Continental Europe with critically acclaimed performances of Tina Packer’s Women of Will, a new production of Hamlet and the revival of PSC’s popular fan favorite As You Like It. The unqualified success of the experience led to immediate discussions from all sides on how to continue the relationship on a more permanent basis. Late in 2012 PSC, the National and the Kolowrat Estate created a plan to share the Kolowrat theatre between the two companies and to turn the Kolowrat Palace into a home for both the National Theatre and Prague Shakespeare Company. The early part of 2013 has been spent flying between Houston, Texas where we created a new production of Henry V with Main Street Theater Company – a production that broke box office records and was again a hit with audiences and critics alike – and putting things in place in Prague for our move into the Kolowrat. CK: Can you tell us a bit how a Texan ends up in Prague? How did you make the decision to stay in the Czech Republic? How long have you now been here? Guy Roberts: I have been coming to Prague since 2007 – with all of the trips focused around the work in the theatre. For awhile I was trying to have a dual existence – creating theatre in both the US and in the Czech Republic. However the work in Prague was so exciting and the Czech Republic has such deep respect for and rich traditions of theatre I realized Prague is where I need to be to really create the work we are interested in doing as a company. So my partner, Jessica Boone and I, loaded everything into a cargo container and shipped it over and Prague is now our fulltime home. CK: Why Shakespeare in English in Prague? Did you initially meet with any resistance to this idea? If so, how did you convince others? What was the Eureka! moment that this could work? Guy Roberts: English language Shakespeare in Prague is really in Shakespeare’s own words a “remembrance of things past.” There is no doubt that Bohemian aristocrats attended plays in English at the Globe and other London theatres whilst on their travels in England. However what is not so well-known is that the rich tradition of experiencing Shakespeare in English in the Czech Republic goes back centuries. During Shakespeare’s own lifetime, it is believed that Robert Browne’s acting troupe – sometimes referred to as the ‘English Comedians’ perhaps gave the first performances of Shakespeare’s plays in English in Prague as early as 1596. Historical accounts confirm that Brown and his men returned to Prague to play in English in 1603 and then later in 1619 to celebrate the wedding of James I’s daughter Princess Elizabeth to the Elector of Palatine. The English language continues to be the universal world language for business as well as entertainment. English also holds the distinction of being the mother tongue of the person generally acknowledged as the greatest writer in the Western tradition: William Shakespeare. To truly complete the experience of understanding Shakespeare one must “hear” the plays in the English language. It is really this question of ‘hearing’ Shakespeare that concerns much of the work of the Prague Shakespeare Company. When Hamlet says to the troupe of travelling players visiting Elsinore, “We’ll hear a play tomorrow,” an enormous difference between the audience of today and the audience of Shakespeare’s day is exposed. Today, largely due to the influence of television and film, we no longer ‘hear’ plays – we ‘see’ plays. Tonight when we perform Henry V in Prague our audiences, just like audiences tonight in theatres all over the world, will attend expecting to ‘see’ a play. This is not a minor difference of experience, it presents a tremendous challenge in reaching a modern audience with works from the classical repertoire today. What Shakespeare did for the first time in dramatic history and in my opinion better than anyone else since was to present the complexity, contradiction and ambiguity of human existence on stage. Human beings are by our very nature deeply contradictory and ambiguous creations. These features in Shakespeare are countless and increased familiarity with the plays only reinforces this fact. I will share with you a specific example. In The Merchant of Venice Shylock has only five scenes and in each one of these scenes his ‘character’ as we would think of it seems incredibly inconsistent. As an actor in today’s theatre this seemingly presents a challenge in performance. However once one gives into the belief that it is these very inconsistencies and contradictions that actually make Shylock a multi-dimensional fully formed and very human creation on the stage we begin to share in Shakespeare’s genius. The key for the actor in the case of Shylock is to fully commit in all five of his scenes to these seeming inconsistencies and the result will in the end be one consistent and satisfying representation of a human being. I have digressed slightly into the territory of what makes Shakespeare actually work on stage in the theatre but it is related to the central question of language. In Shakespeare language is character. For the theatre of Shakespeare’s time it is not what you do as in our modern tradition but what you say and how you say it that defines who you are as a human being. Language for Shakespeare is the gateway into the human psyche and experience. For these reasons, and others, Shakespeare performed in the original English compliments the great tradition of Shakespeare performances in Czech and other languages; deepening appreciation and understanding for audiences, artists and students not only of art, theatre and Shakespeare but the English-language as well. CK: Who comprises the nightly audience for a show? What are the challenges/limitations/rewards to performing in English in a country as ethnically and linguistically as diverse as the Czech Republic? Guy Roberts: Our audiences are extremely diverse – cutting across many social, national, ethnic and economic divides. On an average night our audience will be filled with Expats, students, teachers, tourists and Czechs. About 25-30% are usually reading the surtitles in Czech. There is such a wonderful tradition of Czech and Slovak Shakespeare performances that audiences are very familiar with the plays. The challenges in producing Shakespeare in Prague are basically no different than the challenges producing Shakespeare anywhere else. One of the great joys for me personally is that Prague Shakespeare Company is providing professional English-language theatre for the Czech Republic – something that hasn’t really been done on a consistent large-scale basis before. CK: Which plays seem to especially transcend any language barriers and why? Are there certain productions that seem to appeal specifically to the Czech culture? Have you adapted any of your plays to represent a particular Czech historical or political period? Guy Roberts: The Taming of the Shrew is the most popular Shakespeare in the Czech Republic. The Czechs find nothing controversial about it. The histories are rarely if ever performed with the exception of Richard III. Martin Hilský (who has translated the entire canon into Czech) tells me that for example he doesn’t believe the Henry VI plays have ever been performed in the Czech Republic. Macbeth, Hamlet, Romeo and Juliet and the other big guns are of course constantly in the repertory somewhere. We don’t usually do “concept” productions because our focus as a company is more about freeing the text rather than confining it by some strict conceptual idea. For me unless those kinds of productions are worked out to the most exacting detail they make the plays smaller and somehow less effective. But that is just my personal opinion. We have incorporated Czech and Slovak into our productions, however, with touches like the forest folks in As You Like It speaking Czech. We also have some productions in the pipeline that are truly bi-lingual and that will combine Czech and English to a greater degree. We are planning for example bi-lingual productions of Othello, The Winter’s Tale, and Troilus and Cressida. CK: You recently held auditions for actors in NYC? Where do you find most of your actors and production crew? What is the experience like for your actors who move to Prague from the States? Guy Roberts: Our actors come from all across the world – the acting company is made up of local Prague artists as well as actors from the UK, Canada, the US, France, Russia, etc. Shakespeare is really the glue that binds us all together and working on his plays with all of these different accents and linguistic experiences greatly enriches not just the sound of the text but also the meanings. One begins to hear different nuances of language and meaning when the text is spoken by non-native English speakers. Culturally Prague is such a fantastic city and the Czech Republic in general is such a wonderful place to be that all of our visiting artists seem to feel as if they are in some sort of theatrical nirvana. Prague is a very special place. CK: Can you tell us a bit about the US/Czech connections that you maintain? Does your company tour elsewhere? Guy Roberts: Henry V is the second production in a three year agreement with Main Street Theatre Company in Houston, Texas to co-produce Shakespeare plays using artists from PSC and MST (the year before we created a Richard III and later this season we will take our Macbeth to Houston). Rebecca Greene Udden and I hit it off artistically and intellectually and both of us are interested in international collaboration so it has been an extremely good fit. Also in 2014 we are co-producing a seven person Julius Caesar directed by Tina Packer that will play in Florida at the Orlando Shakespeare Festival and then come to Prague. We will finish our season with another big co-production with one of the largest Shakespeare theatres in the world; it is something we are very excited about but we can’t really talk about it until the project is officially announced sometime in November. We have a tremendously exciting last few months of 2013 – we will be presenting Henry V, Cymbeline, Macbeth, The Duchess of Malfi and the Complete Works (Abridged). It is a very exciting time for English-language theatre in Prague! CK: There are some truly beautiful translations of Shakespeare into Czech. Would you consider a Czech production, or (as is done for some plays) a bilingual production? Guy Roberts: Absolutely. Our main focus will always be as an English-language theatre but we are very open to all possibilities regarding bi-lingual productions. We might in a very special case do a Czech only production – but if we did we would likely offer the same show in English – with one cast playing in Czech one night and the next night the same show in English. CK: Can you talk a bit about the use of Vyse Castle as a performance site? What plays has PSC performed there? Guy Roberts: We have performed Romeo & Juliet, A Midsummer Night’s Dream, King Lear and As You Like It on the outdoor stage and we also performed aHamlet inside the Burgrave’s Residence. We love playing outdoors on the summer stage but we are taking a break from that now to focus on our indoor productions at the Kolowrat. I do hope to return to those performances one day soon. If you are unfamiliar with the Kolowrat Theatre please allow me a moment to digress and give you a bit of information concerning our new home. The Kolowrat Theatre was opened on 2nd December, 1991. 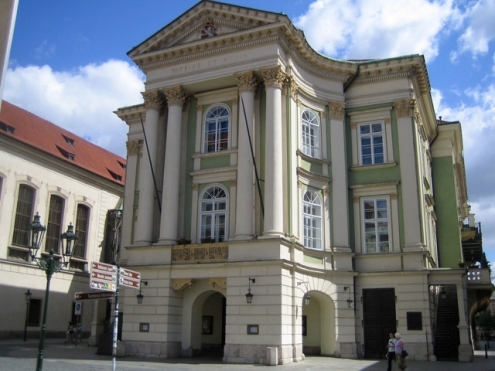 When the building of the Estates Theatre (Stavovské divadlo) was being reconstructed, the adjoining early baroque palace, which had for long been the theatre’s administrative building, was renewed at the same time. Its beautiful facade, of which K. L. Zap wrote in his guide to Prague of 1835 that it “captivates one with its solemn appearance”, was built in 1697 from a design by Giovanni Domenico Orsi. It hides the monumental two-part palace, which has been basically architecturally preserved in its original form, reconstruction having merely removed later alterations which only deteriorated its value. Kolowratský palác (Kolowrat Palace) houses Prague Shakespeare Company’s administrative, dramaturgic offices and rehearsal rooms as well as the technical offices for Narodni divadlo at the Estates Theatre. The extensive loft with its original beautiful and for the most part well-preserved roof truss, sensitively restored has been made into an inspiring place used not only for rehearsals but also as the “Kolowrat Theatre” where chamber plays are produced and because of the close proximity to the audience create a thrilling and unique dynamic. We officially opened our 2013-14 Season in our new home in Kolowratský palác on October 4th with the Czech premiere of our production of Henry V and after that we will premiere three additional productions in 2013 including: Cymbeline, The Complete Works of William Shakespeare (Abridged), and the wheel will come full circle with a new production of our very first endeavor: Macbeth. CK: What are your upcoming plays for this season? Guy Roberts: The rest of our 2013-14 Season expands beyond Shakespeare and into the modern English language tradition including the world premiere of two new plays we have commissioned – the first about Smetana and his iconic composition Ma Vlast and a new version of Kafka’s unfinished novel Amerika, adapted and directed by Gregory Gudgeon. Other performances will include the Czech Republic premiere of the Broadway hit Venus in Fur by David Ives, a new production of Julius Caesar co-produced with Orlando Shakespeare Festival in Florida, a three person adaptation of Crime and Punishment and concludes in June 2014 with our first musical, the Czech Republic premiere of Stephen Sondheim’s and James Lapine’s Into the Woods playing at the Estates Theater June 29th and 30th. 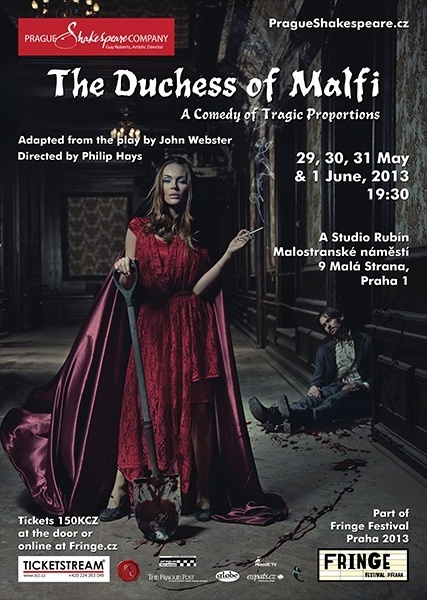 CK: The Duchess of Malfi as a comedy? Do tell! Guy Roberts: It is a fantastically funny production that was nominated for the Inspiration Prize at this year’s Prague Fringe Festival (Fringe Festival Praha 2013). PSC’s The Duchess of Malfi is presented in a style known as opera regia, or tragedia dell’arte, which director Philip Hays was first exposed to while studying with Antonio Fava in Italy. Like the more popularly known commedia dell’arte, it employs stock characters, physical gags, and an improvisational process, but applies them to a tragic scenario. The tone is darker, bloodier, and more dangerous. CK: The Company website states that one of the many key audience groups is the “expat community”? Would you consider yourself an expat? Guy Roberts: Yes for sure I am an expat. As an American living in Prague who feels a deep connection to the Czech Republic and Czech culture, but is still deeply connected to America as well, I feel incredibly fortunate to be able to experience the best of both countries. Thank you Guy for agreeing to this interview! We look forward to hearing more about Prague Shakespeare Company! This interview first ran in The Shakespeare Standard.